This is a fantasy ebook by Daniel Arenson that I picked up as part of a seven book fantasy collection for only 77p. I know, a total bargain! For starters, this book has dragons. Usually this is a sign of a good book, but this one goes a whole step better. It had people who can turn into dragons! 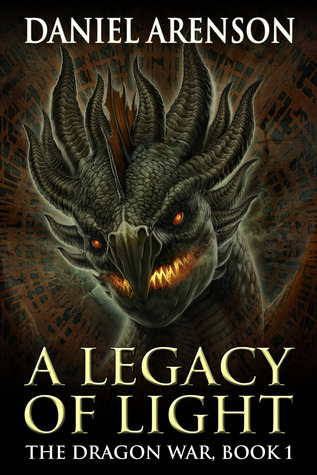 I totally loved the premise for this book with a proper fantasy dictatorship kind of start where a couple of young dragons end up caught up in things bigger than both of them. Did I also mention that these people could turn into dragons? Right yeah, I think I might have. The plot was pretty fast paced and had me reading along without wanting to put the book down and bounced between quite a few really interesting points of view. The bad guys were a little on the two dimensional side but the book felt like it was aimed at a younger adult, mature teenager sort of age so this wouldn’t be too much of a problem for the target audience I don’t think. It is part of a series and I felt like it was a bit of a cliff-hanger ending but not as bad as it could have been, and it tore my heart apart with what happened to the characters. Thankfully the rest of the series does seem to be out there so there’s no danger of getting to a point where you are desparate for more and can’t get it. All in all I loved this book (people can turn into dragons!) and I will be reading the rest of this series, and probably everything else this author has ever written.